Last week I went to a Best Buy and a Kmart, and I picked up a few games. From Best Buy I bought two RPGs. 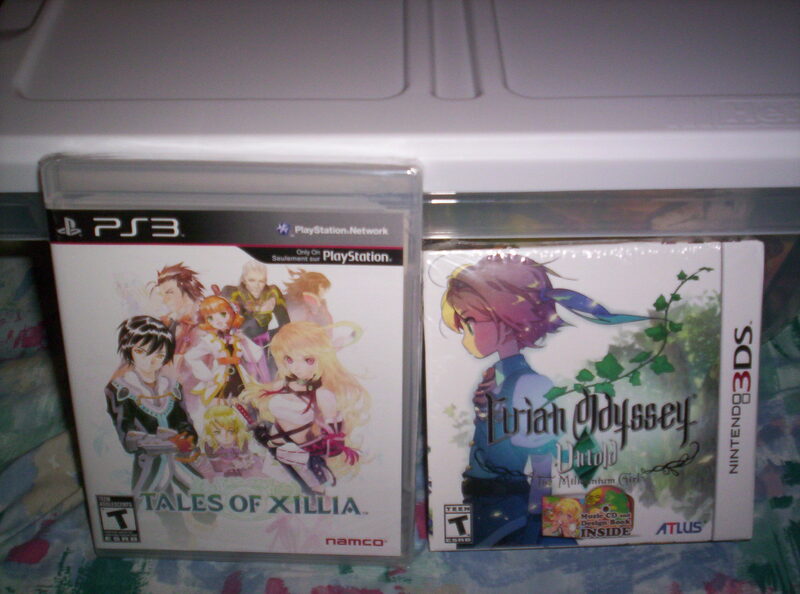 For $30 I picked up Tales of Xillia for the PS3 and for $35 I bought Etrian Odyssey Untold: The Millennium Girl for the 3DS. I’ve heard that Tales of Xillia is the best Tales game yet, so I’m super excited to play this game. I was actually supposed to buy this game several months ago, when there was a limited edition bundle available. Now I can’t find that bundle in stores anymore, so I figured I’d just get this standard edition before the game itself becomes very hard to find. I believe that Etrian Odyssey Untold: The Millennium Girl is remake of the first Etrian Odyssey game for the Nintendo DS. I don’t have that game but I do have the third and fourth Etrian Odyssey games. My copy of Etrian Odyssey Untold: The Millennium Girl comes with a music CD, which I think is pretty sweet. Next stop was Kmart. I ended up buying three games from this store. The regular price for these three games is $19.99 each, but they were on sale for $15 a piece. I didn’t know these three games were on sale before going to this Kmart store. Two other things to note: I didn’t realize that all three of these games that I bought from Kmart were published by EA until after I left the store. I also didn’t realize that these three games are the “third” game of their videogame series until I started writing this blog post. All three games have the number “3” in their title. Anyway, I know that EA is a videogame company that has gotten a lot of hate lately and a lot of that is justified, but they do release some games that I enjoy playing. 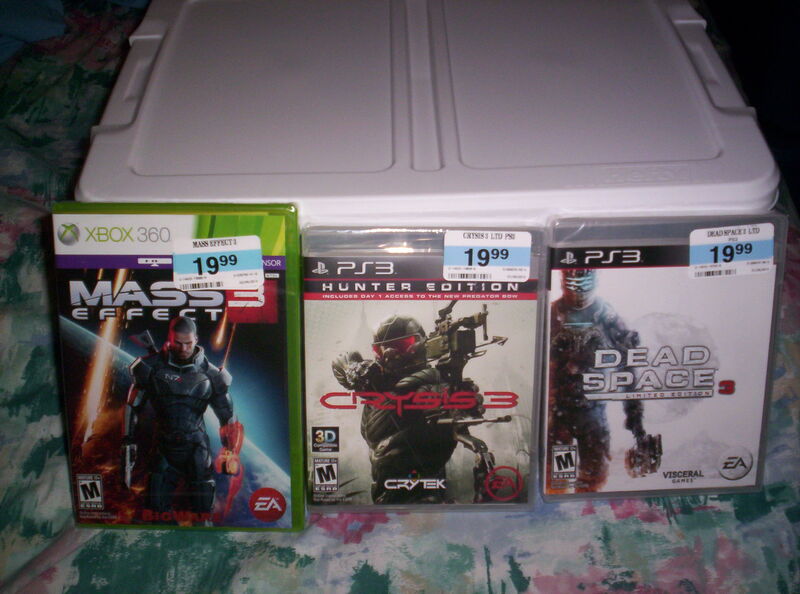 I probably won’t buy Battlefield 4 any time soon, but the three games from EA that I bought from Kmart for $15 each are Mass Effect 3 for the Xbox 360, Crysis 3 (Hunter Edition) for the PS3, and Dead Space 3 (Limited Edition), also for PS3. I absolutely love the Mass Effect games. I do already have Mass Effect 3 for my PS3, but for $15 I don’t mind buying this game again for my Xbox 360. Having played the first two Mass Effect games on my Xbox 360 console, I look forward to importing my save into Mass Effect 3. I don’t remember if Crysis 3 got as much accolades as Crysis 2, but from watching the trailers and gameplay footage, I think I will enjoy Crysis 3. After finishing Dead Space 2 last year, I was itching to get a copy of Dead Space 3. Now I have heard some people who loved Dead Space 1 and 2 say that they didn’t enjoy Dead Space 3 as much or they couldn’t get into it as much as the first two games. I myself love the first two Dead Space games, so unless they really mess up the third game I can’t see myself not enjoying Dead Space 3. This entry was posted in Uncategorized, Videogames and tagged 3DS, 3DS RPG, Crysis 3, Crysis 3 Hunter Edition, Crysis 3 Hunter Edition Playstation 3, Crysis 3 Hunter Edition PS3, Crysis 3 Playstation 3, Crysis 3 PS3, Dead Space 3, Dead Space 3 Limited Edition, Dead Space 3 Limited Edition Playstation 3, Dead Space 3 Limited Edition PS3, Dead Space 3 Playstation 3, Dead Space 3 PS3, EA, EA Games, Etrian Odyssey, Etrian Odyssey 3DS, Etrian Odyssey Nintendo 3DS, Etrian Odyssey Untold, Etrian Odyssey Untold 3DS, Etrian Odyssey Untold Nintendo 3DS, Etrian Odyssey Untold The Millennium Girl, Etrian Odyssey Untold The Millennium Girl 3DS, Etrian Odyssey Untold The Millennium Girl Nintendo 3DS, Mass Effect 3, Mass Effect 3 Xbox 360, Nintendo 3DS, Playstation 3, Playstation 3 Games, PS3, PS3 FPS, PS3 RPGs, Tales of Xillia, Tales of Xillia Namco Bandai, Tales of Xillia Playstation 3, Tales of Xillia Playstation 3 RPG, Tales of Xillia PS3, Tales of Xillia PS3 RPG, Tales of Xillia RPG, video game, Video Games, Videogame, Videogame Shopping, Videogames, Xbox 360. Bookmark the permalink.